Although fire is a primary culprit for burns, there are many other sources of burn injuries to consider during National Burn Awareness Week (Feb. 3-9, 2019) and throughout the year. Children (especially those under the age of 5) and elders above the age of 65 are at particular risk because their skin tends to be thinner than others. The most common cause of scald injuries for young children is hot beverages. If something like coffee, tea, or hot chocolate spills on a child – or even soup – a scald will damage more layers of skin over a larger part of their body. According to the American Burn Association (ABA), it only takes 2 seconds of exposure to 148°F (64°C) water to cause a burn that is serious enough to require surgery. 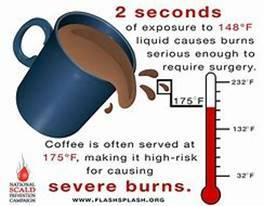 Coffee is often served at 175°F (79°C), making it high-risk for causing severe scald burns immediately. Steam that comes out of microwave popcorn bags is hotter than to 180°F and can burn you in less than a second. The ABA recommends letting the bag sit for at least a minute and then opening it with the bag turned away from your face. Parisi continues, “Cooking is a major contributor to scalds – which makes sense because cooking fires in general are the number one cause of home fires and home injuries. We also see household appliances in general as a source of scalds, and scalds in the restaurant industry where water temperatures in those kitchens have to be kept higher to prevent bacteria growth.” Household appliances that can pose a risk include hot steam vaporizers, radiators, and candle wax warmers. In 2017, there were 376,950 scald burn injuries that required an emergency room visit, which were related to household appliances. 1. Supervision is the single most important factor in preventing tap water scalds. 2. Avoid holding a baby or toddler while trying to drink a hot drink. 3. To prevent spills, turn pot handles away from the stove’s edge; use back burners if possible. 4. Place hot beverages or hot cooking pots where they can’t be pulled down or knocked over. 5. When removing hot items such as cookie sheets or casserole dishes from the oven, only use dry oven mitts or pot holders. If pot holders or mitts are wet, hot cookware can heat the moisture and quickly cause a scald burn. 6. To prevent steam build-up in microwaves, remove tight lids of food containers or use vented containers when cooking.